Fancy cycling around Bolzano and Verona, or by Lake Garda? Cycle Breaks provide fully supported and self-guided cycling holidays in Italy and Western Europe, ranging from 5 to 7 nights. We offer a great variety of inspiring holiday destinations and our cycling tours in Italy include opportunities to island-hop around Venice or bike about to the backdrop of the Dolomites and explore the stunning scenery of the South Tyrol, taking in magnificent Lake Garda vistas on route to the romance of Verona. We choose our accommodation ourselves from a cyclist’s perspective and take pride in delivering a high level of personal service. Our well-researched routes include plenty of places to get a real taste of local flavours. Cycling Tours Italy – click here to browse our cycling holidays in Italy. Cycling Tours Bolzano Verona – click here to see our Bolzano to Verona cycling holidays. Why cycling holidays in Italy? Whether you choose to travel by plane, train or ferry from the UK or head by car or rail across the Continent, Italy awaits with outstretched Campaniles and the warmest welcomes. Northern Italy in particular emerges from the Dolomites with traditions of good hospitality, great cultural offerings, a breathe-easy, still-in-the-mountains-but-not-far-from-the coast climate and a warm, relaxing pace of life. The scene, backdrop and all, is wonderfully set for a fabulous gentle cycling adventure; all that remains is to follow the dedicated cycle paths alongside rivers and memories of bygone railways and freewheel down the country lanes and vineyard slopes. Cycle Breaks itineraries are designed to introduce you to some real cultural treats. There’s certainly a feeling of getting the best of both worlds as you pedal your way along the River Adige from Bozen (Bolzano) in the smart German-speaking South Tyrol towards the oh-so-passionate, opera-in-the-air, couldn’t-be-anywhere-but-Italy city of Verona. The dramatic Dolomites make a for a mightily impressive backdrop for Act 1 of any gentle cycling adventure. The country lanes of South Tyrol lilt like the German language of the region itself, linking characterful villages such as St Pauls and Lake Caldero through orchards and vineyards. Slowly Italian starts to trickle in, courtesy of the next scene – a more river-hugging cycle route which leads onwards into Trentino. 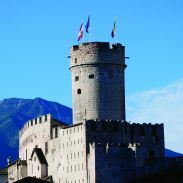 Fortresses and fading frescoes take centre stage in Trento and Roverto for Act 2. Nature reserves and pleasant cycle paths along old railway line routes provide a calm interlude before the descent to Torbole injects some freewheeling fun, setting the scene for Act 3 and the cosmopolitan culture of Lake Garda. Riva del Garda rewards with stunning mountain vistas, cafés and cruises down Lago di Garda, Italy’s largest lake. There’s plenty to keep you here for days on end from watersports to spas, Roman history to charming villages and a host of small islands. Leaving Trentino behind, the Veronese hills beckon at the other end of the lake, rolling gently with riverside paths and vineyards. All roads here (or cycle routes) lead to Verona, though Romeo’s supposed place of exile, Mantua, is physically a close second. With its dramatic architecture, impressive legacies and operatic passion, Verona makes a fitting final Act and cultural feast for a great gentle Italian adventure on two wheels. Cycle Breaks route information serves as an excellent programme to guide you through scenes and settings for your cycling holiday. It provides plenty of top tips – refreshments for the intervals anyone? – and options along the way so you can choose your own pace, follow the occasional suggested detour if you wish, without ever fear of losing the plot. Call it Bozen, or its rather more lyrical Italian name, Bolzano, the old trading city and capital of South Tyrol seems to have year-round appeal. No more so than with shopaholics who will love grazing the season’s latest quality offerings in the smart stores, and fall in love with the nostalgic Christkindlmarkt when Christmas starts to whisper its way through the jagged Dolomite peaks. The city is full of mountaineering history and renowned for its fine museums. At the Museum of Archaeology, come face to chilly face with Otzi the 5,000-year-old man found preserved in the ice on a nearby glacier. Trento excels in contrasts too. Rich and prosperous and set against rugged mountain backdrops, the warm university city has a vibrant, cosmopolitan feel. North and south sit surprisingly, yet comfortably together here with austere Germanic influences such as the formidable fortress, Castello del Buonconsiglio, alongside more flowing or faded legacies like Case Rella’s frescoes and the Baroque fountain in the Piazza Duomo. When it comes to cosmopolitan though, no one area of this part of Italy seems to do it better than the resorts and villages around Lake Garda. In the north, Riva del Garda with its medieval fortress is a great place to start a cruise and admire the views of Mount Rochetta and Monte Baldo. To the south,picturesque fortified towns such as Sirmione, once popular with ancient Roman poets, trades on its spa heritage, bright with bars and frothing over with cappuccino culture. Though less than 17kms wide, the lake is over 50 kms from end to end and is a ‘hip’ haven for watersports and a refreshing stay on a shoreline in a unique mountain setting. Verona sings its own praises as well as opera. The 30,000-seater Roman amphitheatre, the Arena di Verona, is a must-see even when not set to music. The redbrick Ponte Scaligero and the Ponte Pietra where Julius Caesar once dared to tread are legendary too; but the jury tends to be out about the absolute authenticity of Juliet’s balcony. Why choose a Cycle Breaks holiday in Italy? We have developed our Italian programme slowly, choosing tours carefully. Listening and learning from our cycling customers since 1991, our Cycle Breaks team understand your priorities and pride themselves on personal service. We simply love Northern Italy and cycling too – and sharing our enthusiasm and expertise. We visit the hotels personally, refining selections and preparing our own detailed route notes from our own research. The detail in our tours is appreciated by our customers and our holidays are considered to be good value for money. Our aim is to offer real peace of mind. We can advise on the suitability of routes, how to get to your chosen start destination and tailor itineraries to individual requirements. Leave it to us to organise your accommodation, arrange luggage transfers and en-route support and prepare meticulous route notes and mapping with top tips all round. You can set out on your gentle Italian cycling adventure and really relax as you pedal across the piazzas, reflect on the mountainous beauty of Lago di Garda or visit Verona at your very own pace. Cycling Tours Lake Garda and Northern Italy – click here to view our Lake Garda, Bolzano and Verona Cycling Tour.